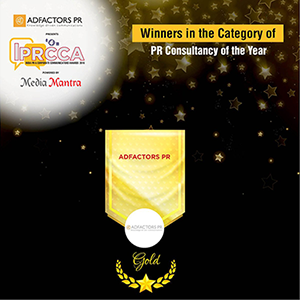 Adfactors PR made it seven-in-a-row, when it won the Agency of the Year title at the India PR & Corporate Communications Awards (IPRCCA), hosted by exchange4media, this evening. Separately, the consultancy won eight trophies – a mix of gold, silver and bronze – for campaign excellence on behalf of clients including ICICI Bank, ICICI Lombard, Pidilite Industries, Kailash Satyarthi Foundation, Aviva Life Insurance, Premier Futsal, and Cochlear India. The jurists, notably, conferred the Lifetime Achievement Award for Public Relations to Adfactors PR chairman Rajesh Chaturvedi for his contributions to the industry and guiding Adfactors PR to become India’s largest PR firm. Separately, Hemant Batra, senior vice-president with the Financial Services practice, was chosen as the PR Person of the Year for his commitment to the profession and the firm, his work, the awards won, and the business impact of his work.